NEW YORK (CNNfn) - The Federal Reserve cut interest rates half a percentage point Monday to bolster the economy and U.S. markets after the worst terrorist attacks ever against the United States. The cuts, the eighth by the Fed this year, came six days after the attacks that destroyed the World Trade Center in New York and damaged the Pentagon last Tuesday. They were widely expected as the central bank seeks to keep funds flowing through the economy -- and boost consumer confidence -- after the attacks. The central bank cut its target for short-term rates to 3.0 percent from 3.5 percent, the lowest level since September 1992, in a bid to make money more accessible to consumers and help avoid a recession. The Fed also cut the seldom-used discount rate to 2.5 percent from 3.0 percent. "The Federal Reserve will continue to supply unusually large volumes of liquidity to the financial markets, as needed, until more normal market functioning is restored," the Fed said in a statement. The action came after an emergency conference call among Fed policy-makers at 7:30 a.m. ET, wire services reported. The call began with a moment of silence for the victims of Tuesday's attacks, according to reports. 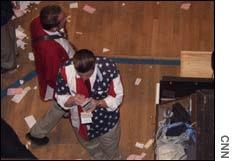 The cut was announced about an hour before U.S. stock markets opened after a four-day hiatus. "It's pretty much expected due to the extraordinary situation," said Sadakichi Robbins, head of global fixed income trading at Bank Julius Baer. "Their biggest concern is making sure there's ample liquidity, especially as the equity markets open. The bond market had been expecting it." U.S. stocks began trading again Monday after being closed for four days, their longest break since the Great Depression. Stocks were sharply lower in the first hour of trading, stabilized for several hours, and then sold off more sharply in the afternoon. Some economists say market volatility could add to consumers' woes and hurt spending, which fuels two-thirds of the U.S. economy. "It's probably wise they [cut] before the opening bell," said Lara Rhame, U.S. foreign exchange economist at Brown Brothers Harriman. "They wouldn't want to [be seen as] reacting to the stock market, but they are trying to show that they are willing to do what it takes to maintain confidence." It was the third inter-meeting rate cut of the year for the Fed, and it's likely the Fed will cut rates again, either before or at their next policy meeting, scheduled for Oct. 2. "It is certainly possible that the Fed could cut rates further, and it is very probable that the Fed will continue to pump liquidity into the markets," former Fed Vice Chairman Preston Martin told CNNfn's Market Call program. The economy already was on shaky footing, with slow business spending, a manufacturing sector in a year-long recession and consumer confidence beginning to sag after hundreds of thousands of job cuts. But economists also expect that the Fed's actions, combined with expected economic stimulus from the U.S. government, should be enough to shake off the initial stock market jitters and help get the economy back on course. "I remain more confident that the consumer will take great comfort in knowing that our government is truly taking care of business," said Anthony Chan, chief economist with Banc One Investment Advisors. Though the Fed said it thought the risks to the economy still were weighted mainly toward weakness, it also said it thinks the U.S. economy still has a solid foundation for the long run. "The long-term prospects for productivity growth and the economy remain favorable and should become evident once the unusual forces restraining demand abate," the Fed said. U.S. Treasury Secretary Paul O'Neill agreed, telling CNNfn's Lou Dobbs he still expected the economic stimuli of several Fed rate cuts and a tax cut recently passed by Congress to pull the economy out of its year-long slowdown. "With the flow of funds that was going into the economy a week ago today, I would have said then -- and I will say now -- I think we're on the move back," O'Neill said. Immediately after the Fed's announcement, Bank of America Corp. (BAC: down $3.30 to $54.35, Research, Estimates) said it is cutting its prime lending rate to 6.00 percent from 6.50 percent, effective Tuesday. Other banks are expected to follow suit soon. With concerns high about the health of the global economy, the European Central Bank, which has shown reluctance to cut interest rates, cut its key minimum bid rate to 3.75 percent from 4.25 percent, saying it wanted to boost confidence in the European economy. "It shows the world central banks recognize the financial markets could use a little extra liquidity and support," said Gary Thayer, chief economist at A.G. Edwards. "Hopefully it will help restore confidence. A lot of people expected we would see some sort of coordinated effort." Before the cuts, the Japanese Central Bank bought U.S. dollars to support the currency, afraid that a strong yen could hurt Japanese exports. The dollar traded lower early Monday, recovered some of its losses after the action by the central banks and then retreated again as equity selling accelerated.